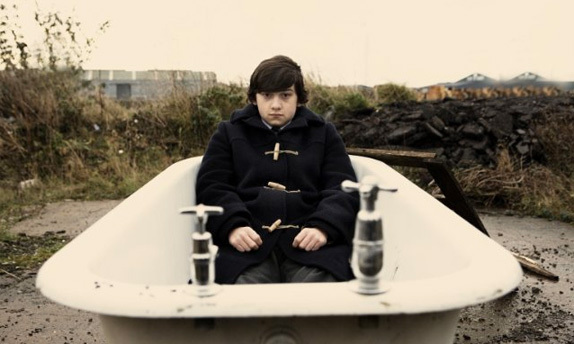 A precocious Welsh teen narrates his way through what director Richard Ayoade clearly hoped would be his Rushmore. Submarine is no Rushmore, first and foremost because, unlike Wes Anderson’s Max Fischer, Ayoade’s protagonist, Oliver Tate, is a charmless, boring, dolt whose observations about the world around him are unconvincing, banal, and strain so hard to be wise that they come off as too cute by half. I should have seen it coming, as the film opens with an obnoxious written note to American audiences from the character of Tate introducing us to Wales and thanking us for not invading his country. Thereafter, Tate’s dull voiceover intones that he does not like scenery, he believes his neighbors are ninjas, he can only see himself in a “disconnected reality” and other like observations meant to be charming and insightful. He’s also monitoring the sexual activities of his parents by checking their bedroom dimmer switch. Full disclosure: my son and I turned it off after 11 minutes.